Located in the picturesque Thousand Islands Region of Eastern Ontario. The home of Miniature Long-haired Dachshunds of Quality where all our dogs are bred for Temperament, Health & Longevity, Brains & Beauty! Dachshunds have been described as lively, boisterous, energetic, stubborn, hardy and comical as well as elegant, intelligent, and sensitive. They are all this and much, much more! A truly remarkable little dog! With its great variety of coats, sizes and colour/pattern combinations to choose from there is just the right dachshund to share your life and your home. 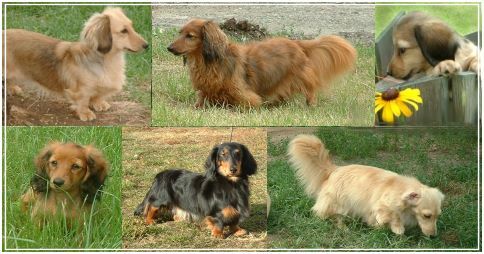 To learn more about Pamadron Dachshunds and their people check out our About Us page. We invite you to enter our special world of Pamadron Miniature Dachshunds! Please do not use any of the pictures you see on our site without first asking the owner. If permission is granted please acknowledge the photos come from Pamadron Perm Reg'd (Canada).